HeartBrand Akaushi genetics are currently being utilized around the world for hybrid vigor, increased premium opportunities and cattle performance. Whether you are looking to participate in our buyback program, want to enter a quality-driven market, start your own branded beef program, breed a more consistent calf crop, or simply improve your quality grade; Akaushi genetics can help. Our program is not cookie cutter or one size fits all and we have more than 200 bulls and multiple donor cows and females to select from. Producers from Columbia, Venezuela, Brazil, Australia, and North America trust HeartBrand genetics to help grow their profits and their programs. Akaushi genetics can improve the quality grade of your cattle in just one generation. The introduction of an Akaushi bull has shown to provide an average of 37-39% prime and 50-60% choice in just one cross. While improved carcass quality is an obvious advantage to using Akaushi or any other Wagyu breed, Akaushi offers many other added benefits. The Akaushi breed is known for calving ease, heat tolerance and increased consistency in both cattle and meat type. Akaushi is an excellent choice for growth and allows producers to harness the advantages of hybrid vigor. Hybrid vigor in the half-blood Akaushi animals allows for rapid improvement in just one generation but also increases fertility of the animals if a producer seeks to keep back replacement heifers. Choosing Akaushi bulls is a low-risk and simple management change that provides an immediate opportunity to earn a premium. The producer keeps the cowherd he’s spent years developing, the vaccine and protocol supplement remain the same, but Akaushi half-blood offspring are worth more. Compared to other programs that often require a large upfront investments, adding Akaushi genetics or participating in our buyback program is a easy way for a producer to improve his meat quality and bottom line. HeartBrand is Best Beef Money Can Buy. At HeartBrand, our mission is simple. Breed cattle that produce the best beef money can buy. And that's exactly what we do. 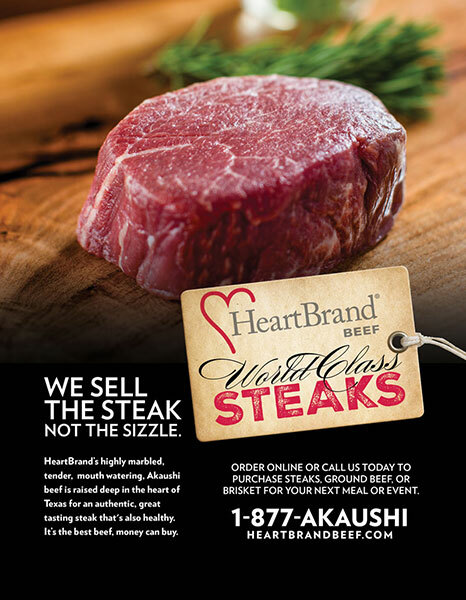 Visit our retail beef website to order HeartBrand steaks and see why we're known for the STEAK...not the sizzle.